Today (06 Aug 2018) I opened an email sent to my Gmail account yesterday by FamilySearch.org. It advised me that I had records for ancestors or relatives to possibly attach to my FamilySearch Family Tree (I am referring here to only my little section of FamilySearch’s Family Tree). There were several records listed for a variety of extended family members, including 22 records for Finnish relatives on my father’s side. Among these, there was one from Finland for my great grandfather Otto; other records from Finland were for other distant relatives. There were American records as well, including ones for my grandfather Evert, my aunt Edith, and my uncle Hugh. On my mother’s side, there a variety of records among the 18 for close and distant relatives. Compare the information on the record (left) against the information already known about the person in the tree (right). If information like names, dates, places, and relationships match up, state the reason that this record belongs to the person then click attach record. 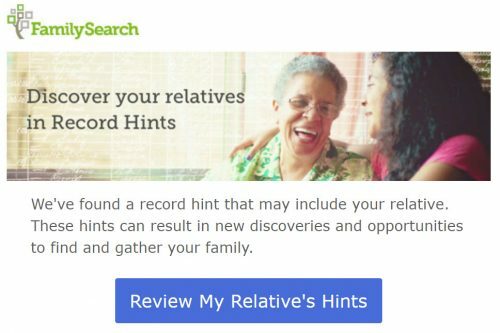 I followed the instructions to the letter and checked out each of the record “hints.” They all passed my scrutiny and so I added them to the appropriate relatives on my little section of the Family Tree on FamilySearch.org. Note: In March 2013 Family Tree was added to the familysearch.org site. It is available to any registered user. As a user views a family in their tree, he or she may see hints of historical documents related to that family. Family Tree has replaced new.familysearch.org. When I created my account four or five years ago, I wondered why FamilySearch.org required me to enter an email address. Now I know why.